This paper uses the ENTICE-BR model to study the effects of various climate stabilization policies. Because the ENTICE-BR model includes benefits from reduced climate damages, it is possible to calculate the net economic impact of each policy. In general, only the least restrictive concentration limit is welfare enhancing. While the policies are welfare enhancing in simulations using optimistic assumptions about the potential of the backstop energy technology, such assumptions mean that the backstop is also used in the no-policy base case, so that climate change itself is less of a problem. Finally, assumptions about the nature of R&D markets are important. Removing the assumption of partial crowding out from energy R&D nearly doubles the gains from policy-induced energy R&D. 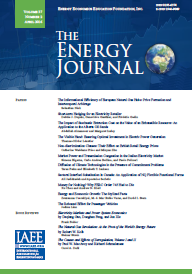 Published in Endogenous Technological Change, Special Issue #1 of The Quarterly Journal of the IAEE's Energy Economics Education Foundation.